How to Think on Your Feet by Speaking From a Blank State of Mind. When asked to think on your feet, many people say there is nothing in their heads to talk about. They think they are frozen. They say they are “blank.” Worse, they judge themselves negatively, and think having a blank mind is wrong. It is not wrong to be blank. I believe it is the right place from which to start speaking in an impromptu situation where you must think on your feet. Here’s why. What is Thinking on Your Feet? When you are in a situation to think on your feet, you are being called on to say what you already know. You are usually being asked to explain one of two topics. The first topic is explaining your expertise or “What do you know about…?” The second topic is sharing what is real for you at that time, such as “What do you feel about…. ?.” Both of these topics are stuff you know and have already thought about. Since you know these topics well, your task in thinking on your feet is to access the deep thinking you have already done and then to allow those thoughts to flow out of your mouth. Your deepest thoughts come from the core of your being. And, the best way to access them is through deeper states of awareness like silence or blankness. All you have to do is to learn to trust yourself to speak from blank. What Gets in the Way of Thinking on Your Feet? The only thing that gets in the way of thinking on your feet is the thought that you can’t do it. Think about it for a minute. Remember a time when you froze and went blank when you needed to speak. What came up in your mind was the thought that you might not be able to think and speak. That thought came up and caused you to go to a blank state of mind. Your mind gets stuck, or thinking “I can’t do this! I don’t know what to say”! All you have to do is confront that thought and release it by practicing a few times so you can trust yourself to think and speak from the blank state of mind. Here is a quick exercise that you can use to train yourself to speak from a blank mind in order to make it easier to think on your feet. Plan to take 30 seconds to think and 1 minute to speak in your first attempts. Later you can shorten the thinking time and lengthen the speaking time. You will need a partner for this. Ask a friend or partner to create some topics (1) about your expertise and (2) about your true thoughts or feelings about something relevant to your life. The partner should ask you one question. Then, take 30 seconds of silence. For the first 30 seconds, wait for the thoughts to come up. Practice breathing deeply and waiting until the thought comes. At the end of 30 seconds, the partner will say, “Speak.” Then, speak the words as they come to you. Don’t judge your speech, just let the words stream out of your mouth. I suggest you record it so you can listen later and evaluate. Take turns being the partner and the speaker. After a few tries, you will start to get the hang of speaking from a blank state of mind. You may be surprised how easy it becomes and how this exercise translates into greater comfort thinking on your feet in work and social settings. 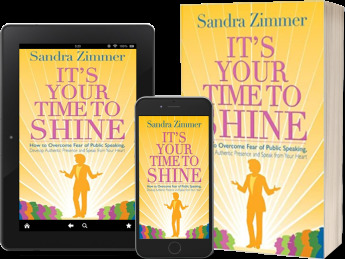 If you’d like the experience of learning to think on your feet in a group setting, consider a Sandra Zimmer Method group speaking course or workshop. You can see a schedule of upcoming programs.